A Pope without white hair? Why not? As I understand it there is a vacancy coming up in the papacy and I think I might be just the person they need right now. I realize I may not meet all (or any) of the applicant requirements, but you don’t win the lottery if you don’t buy a ticket, right? Some may feel that I’m not qualified because I don’t believe in God; however, I could make an argument that based upon their actions, it would seem that some Popes didn’t believe in a God either. I’m not an atheist¹ nor do I have a problem with anyone who chooses to believe in a God. I just think that the accountability for good and evil should reside in the acts of a person, not attributed, nor blamed on a God or devil. I used to be a Catholic and that should qualify me for the position. If not, perhaps the fact that I’ve also been a Protestant and a Seventh Day Adventist should show that I have a wide variety of experience as a Christian. As an Adventist I even studied the entire Bible, so I know what it actually says about Christianity. But enough about my qualifications, let’s talk about what I can do for the Catholic Church. So then each of us shall give account of himself to God. Therefore let us not judge one another anymore, but rather resolve this, not to put a stumbling block or a cause to fall in our brother’s way. That passage defines how a Christian is to behave and it needs no interpretation of a holy man. Bottom line, mind your own business. That God you allegedly believe in will decide what is a sin or not. Both passages tell Christians that engaging in politics to declare the sins of another person is forbidden, and so shall it will be if I’m made Pope. Further, any Catholic who promotes the use civil laws and government policy to restrict, prohibit, restrict, or regulate the alleged ‘sin’ of another shall be excommunicated. If you believe in a God, then don’t try to be the God. Another change will be to abolish marriage restrictions on priests. Not only will they be allowed to marry, it will be encouraged, and they will be encouraged to have families. There is no better way to understand the meaning of life than to be a parent of a child and a priest with a family can relate to his or her flock better than a priest without one. If you caught that last reference to priests as “his or her” then you know I will allow women to be priests. Not only will women be allowed to be priests, but gay and lesbians will be allowed. Anyone who has the capacity to love another person is too valuable to not consider for Church leadership. Also, it’s time Catholics put some distance between us and the Baptists. 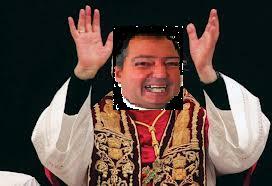 Finally, one of the other major changes I will make if selected as Pope will be to eliminate some of the rituals of the Church. If there is a God, why should we try to bore Him or Her with the same old, tired policies and procedures week after week? I know these changes will cause many current Catholics to denounce their faith, but I’m confident we’ll be fine without them. The new Catholics we gain will be true Christians, and that seems more important to me. So, who will be contacting me and what’s the next step in the application process? NOTE: This article was originally titled “Pope Paul I.” After I published it I researched the names of the Popes and discovered there have been six Popes using the Pope Paul name, thus the change to Pope Paul VII. ¹Regarding the term ‘atheist,’ we don’t attach a name to everyone who doesn’t believe in something mythological. If you don’t believe in invisible gorillas does that mean I can call you an aprimatist?